The following forms will be needed to sign-up for the Tech Titans video contest and for all video submissions. STEM stands for Science, Technology, Engineering, and Math. Today's STEM professionals create virtual worlds, design amazing machines, invent new materials, construct earth-friendly buildings and engineer cutting-edge air vehicles. What is a STEM career? Technologies associated with High Tech Classrooms are numerous and include those available now and those still in development. 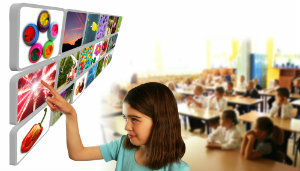 Smart devices such as Phones, Computers, Tables, Interactive Projectors and White Boards are being used today in some classrooms. 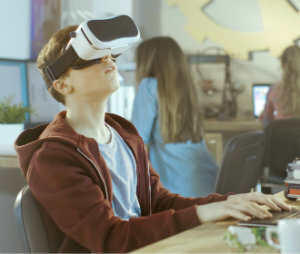 These smart devices will enable current and future technologies such as virtual and augmented reality and on-line learning to be used in future. Technology will certainly be a major factor in how education in the future differs from education today. However, it won’t be the only influence. Successful educators will realize that they need to rethink the entire model of education and redesign it so that it is more student-centered. Moving walls may make spaces more adaptable. With technology as an enabler, flexible assignments may be able to accommodate multiple learning styles. In the Smart City of the future, we will have to figure out how to manage our trash. 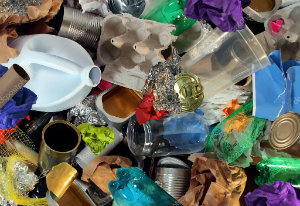 Today there are landfills and other ways that we manage trash, such as recycling. As technology advances, there are many opportunities to create better waste management techniques. Areas that could benefit from technology are collection, distribution, recycle and reuse. The links below provide some background on waste management and potential changes for the future. Combine waste management with all the opportunities of a smart city and the options for the future are exciting. Health tech is the use of technology to improve any area of healthcare, from treatments to the systems that support medical institutions. There are many uses of technology within the healthcare field because there are many different operations, services and focuses. Supported by the widespread availability of smartphones and tables, doctors will be able to reach a large audience at a low cost as well as support innovative diagnostic and recording options. Such technologies will improve the quality of healthcare because it will be delivered through earlier diagnosis, less invasive treatment options and reductions in hospital stays and rehabilitation times. Advances in health tech will also focus on cost reduction perhaps through improved medical devices and information technology applied to healthcare. The development of innovations in Health Tech may impact current social and ethical issues surrounding healthcare. For example, physicians may seek objective information from technology rather than listening to subjective patient reports. In another example, the automation of medical records might impact cost and availability of insurance for those predisposed to have a serious illness. 3D/4D printing - what’s next? The fundamental rule of 3D printing is that it’s an additive manufacturing technique, unlike machining, turning, milling, and sawing which are subtractive. There are different kinds of 3D printing and all objects are built out of layers starting with the bottom layer, waiting for it to dry or solidify, and then working its way up. This layering process differs depending on the printer and the material it works with — metal, wood, plaster, polymer, resin, chocolate, and even stem cells. It is fairly safe to assume that in the future we’ll be able to manufacture almost anything with a 3D Printer. It is important to note that we already have very accurate tools for creating 3D models of existing objects; we have the ability to scan an object and then create an exact copy using a 3D printer. Many commercial printers are labeled as “self-replicating,” in that they’re capable of printing their own replacement parts. In other words, in the future if we gave a 3D printer some kind of artificial intelligence, who knows what it would turn into considering that 4D printing, will use smart materials that will repair themselves when broken. In the 1980s, computers began entering the mainstream workforce completely changing the way work is conducted by making it easier to perform tasks anytime and anywhere which has resulted in businesses hiring their workforce from around the world. Since that time, many jobs have disappeared, but many more have been created because of this amazing technology. 3D Printing is in its infancy today, and is expected to have the same or perhaps even greater effect upon careers and the workforce as computers. As with any new technology, it is hard to predict the future, but 3D printing, is already beginning to make advances that indicate that it will be a very important technology. An example would be a company such as automotive repair shop, which in the past had to order parts for the vehicles they were repairing, could now print the parts in their shops and save time and the expense of shipping. And if it is a body part such as a fender the color of the car is in the printed part. Also, people who have ideas of how to design and make products could become entrepreneurs. An example would be similar to Air B&B, which allows people to rent out their homes, and Uber or Lyft, which allows people to transport people around, 3D printing can be used by individuals to produce any product they design to be sold to others. • Candy in the form of particular items such as the 1965 Ford Mustang commissioned by Ford Motor Company to celebrate the Mustangs 50th anniversary. • Retailers will ship cartridges of raw materials needed to print the items. You can see that just like with computers which started out doing simple tasks and are now used to design products that can think and act, 3D Printing has a future that no one can yet imagine. Driver error is the most common cause of traffic accidents, and with cell phones, in-car entertainment systems, more traffic and more complicated road systems, it isn't likely to go away. But if drivers aren't going to concentrate on the road, who is? If technology continues on its current course, your car and other autonomous vehicles on the ground will do the concentrating for you. Automakers are developing complex systems that allow cars to drive themselves. They're also furthering existing technologies such as self-parking and pre-safe systems. You may even be surprised to find out your old clunker already sports some driverless technologies. Technology behind cars can operate with minimal input from drivers, and can be used in the areas of mass transit, personal transit, freight delivery, taxi/uber services, food delivery, and smart cities. They will impact public policy, safety, the insurance industry, driving jobs, hospital emergency rooms, police patrol and many others once the safety and technology is perfected and the legal issues around letting the robots take over are worked out and approved. Now that the government has set standards for autonomous vehicles in the air (drone) usage. More and more businesses are realizing that you can have value from lower-cost autonomous vehicles to work’ in industries like agriculture, construction, mining, and things we haven’t even thought of yet — to create attractive new research, manufacturing and service jobs. Drone software companies will gain more traction by empowering businesses worldwide to make use of the drone’s data by transforming it into actionable information in the form of easily-shared maps, digital elevation models, and 3D models. These include applications in air quality, water resources, and hyperspectral imaging relevant to agriculture, monitoring infrastructure, detecting gas leaks, geophysical surveying and many other uses. Autonomous underwater vehicles are increasingly being used in marine, scientific, military, commercial and policy applications. Since autonomous underwater vehicles can go deeper than human divers and can explore in worse conditions, they are being used more and more frequently to search the ocean floor for various applications. Space exploration has been accomplished by many manned and unmanned space vehicles. The unmanned space vehicles have various levels of human interaction. Future space autonomous vehicles could be used to expand space exploration for initial investigations or to explore areas where transporting a human to the area would be difficult. While the quickly advancing fields of automation and artificial intelligence will most certainly revolutionize every aspect of human life—and are already making an impact on everything from military strategy to medical procedures—robots are taking over increasingly complex tasks, after all, they excel in crunching numbers, lifting heavy objects, working in dangerous environments, moving with precision, and performing repetitive tasks. New forms of man-machine interaction will emerge and the structure of both industry and society will evolve to accommodate this emerging and symbiotic relationship. Humans still have a number of advantages over their automated counterparts, including creativity, curiosity, empathy, self-motivation, and the ability to provide fast, multidimensional feedback. And by working hand-in-hand with advanced robotics technology, we can combine the best of man and machine. As speech and image recognition improve, memory and analytics capabilities increase, and virtual and augmented reality options advance, better, faster and cheaper robotics options for humans will emerge. These technologies deal with automated machines (robots for short) that can take the place of humans in dangerous environments or manufacturing processes, or resemble humans in appearance, behaviour, and or cognition. Many of today's robots are inspired by nature, contributing to the field of bio-inspired robotics. Throughout history, it has been frequently assumed that robots will one day be able to mimic human behavior and manage tasks in a human-like fashion. Today, robotics is a rapidly growing field, as technological advances continue; researching, designing, and building new robots serve various practical purposes, whether domestically, commercially, or militarily. Many robots are built to do jobs that are hazardous to people such as defusing bombs, finding survivors in unstable ruins, and exploring mines and shipwrecks. Robotics is also used in STEM (Science, Technology, Engineering, and Mathematics) as a teaching aid. Robotics Applications - As more and more robots are designed for specific tasks this method of classification becomes more relevant. For example, many robots are designed for assembly work, which may not be readily adaptable for other applications. They are termed as "assembly robots". For seam welding, some suppliers provide complete welding systems with the robot i.e. the welding equipment along with other material handling facilities like turntables etc. as an integrated unit. Such an integrated robotic system is called a "welding robot" even though its discrete manipulator unit could be adapted to a variety of tasks. Some robots are specifically designed for heavy load manipulation, and are labelled as "heavy duty robots." • Caterpillar plans to develop remote controlled machines and expects to develop fully autonomous heavy robots by 2021. Some cranes already are remote controlled. • It was demonstrated that a robot can perform a herding task. • Robots are increasingly used in manufacturing (since the 1960s). In the auto industry they can amount for more than half of the "labor". There are even "lights off" factories such as an IBM keyboard manufacturing factory in Texas that is 100% automated. • Robots can serve as waiters and cooks. Also at home. Boris is a robot that can load a dishwasher. • Robot combat for sport – hobby or sport event where two or more robots fight in an arena to disable each other. This has developed from a hobby in the 1990s to several TV series worldwide. • Cleanup of contaminated areas, such as toxic waste or nuclear facilities. • Household robots with full use.